Monday/Wednesday/Friday 8:00 a.m. – 3:30 p.m.
Tuesday/Thursday 8:00 a.m. – 8:00 p.m.
Are you a caregiver of a loved one who feels that you would like to talk to someone and share your thoughts? 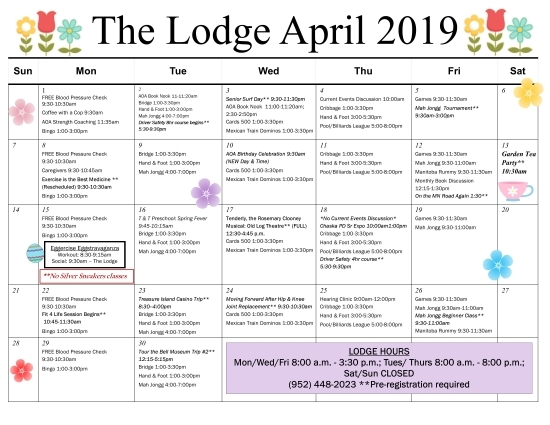 Caregivers meet the second Monday of each month in the morning at The Lodge multipurpose room at the CCC. Call Pat at (952) 448-4016 if you have questions or would like to find out more. Join fellow AOA’s in discussing current events and topics. The first and third Thursday of the month at 10:00 a.m. The second Wednesday of each month we’ll be celebrating our AOA’s birthdays at 9:30 a.m. Cake and coffee will be provided. Everyone’s welcome. 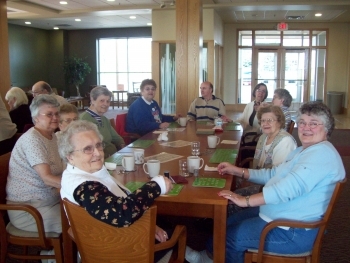 The second and fourth Friday of the month is the organized time to play Manitoba Rummy. Play from 9:30–11:30 a.m. 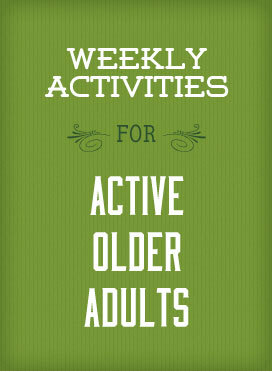 This group meets the second Friday of each month 12:15 – 1:30 p.m.